My niece and her friend spent the night with us this weekend and they always want to do some sort of craft when they come over. They wanted to cover clipboards so they could play school so we headed off to Target. We didn't find your standard clipboards but we did find these: How great is that? 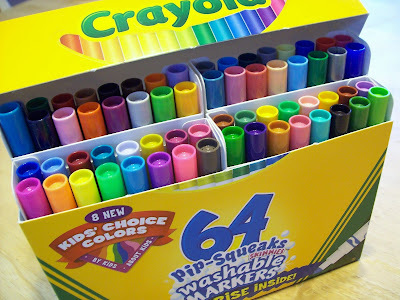 64 different colors of markers in one box???? We had to buy a set. Have you seen these? Is this news to only me? Are they new or did I not get the memo? 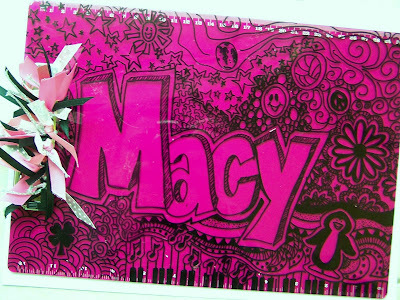 We found pink plastic clipboards so I doodled their names and other things for them on each one. I love to doodle with Sharpies. 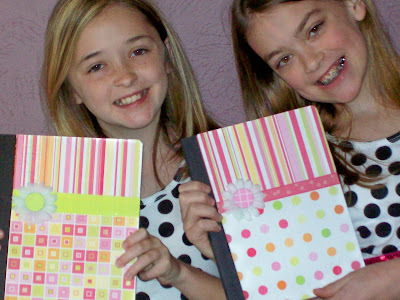 Then they covered notebooks with scrapbook paper and modpodged over the top. 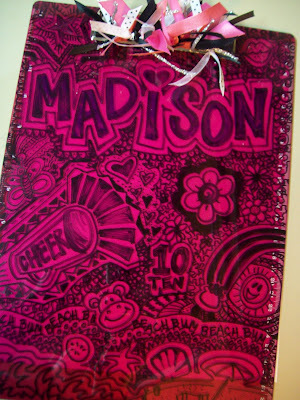 I have to say--you are pretty impressive doodler. Those look great. Thanks for stopping by and leaving comment. I really appreciate it. Oh ya, I wanted to tell you I love the name of your blog. That is so how I feel. Wow. That IS some impressive doodling!! Those were too cute. No, I've never seen those markers before. That looks like a pretty nice set, and I love that they are in a crayon type box!